Computer metaphors do not always work well in real world. Here's an example of a metaphor that produces good results when transported in life: RAM vs. permanent storage. Each productivity system (e.g. Getting Things Done) worth its salt recognizes that our brains have limited RAM and we cannot keep in mind too many things at once. But we can use what is called an exocortex - an extension to our brain to augment our capabilities - namely, the Internet, but even a sheet of paper where to write our calculations, or diagrams. One of the uses of the exocortex is storage: a simple paper notepad that is always with you will be able to function as an hard disk, and your brain RAM will be freed and available for other purposes. The point is not only to avoid forgetting an idea or a TODO, but to avoid worrying about forgetting at all. Here's an example which doesn't work. Real time notifications are more and more embedded in our system; the sources of input are instant messaging system like email and Twitter. Technology does wonder: compare snail mail to an email being delivered in seconds. Yet we find ourselves avoiding the wonderful technology of real time communications: interruptions are considered a menace for our flow and our Pomodoros. In order to get large batches, I visit GMail only few times a day, and I'm working on lowering this number; I avoid any kind of GMail or Twitter applet in my panel (although they may work for managers: I'm talking about creative work as put in danger by interruptions). Polling is often a waste of CPU cycles for computers, and in fact they are built from the ground up on an event-based model: hardware interrupts. Yet the model fails miserably when, due to the inability of humans to multitask like a machine. Certainly employers will coem to you and say "Geez, you're doing such a good job programming, let's have you not program. You should go in management where you can make the real money." And of course that happen to me as well, but I could never take my fingers off the keyboard [...] even while running a company, I still write code and I write it a lot. Here are my articles published during this week. Practical PHP Refactoring: Substitute Algorithm is about changing an algorithm without impacting the rest of the codebase. HATEOAS, the scary acronym is a list of metaphors for understanding this REST concept. Practical PHP Refactoring: Move Method is one of the first larger-scale refactoring we can make to PHP (and non-PHP) code. I'm packing up some gear (and some dinner) for my trip to Torino for the PHP.TO.START. The path from Porta Nuova station to the event is in the most central area of the city, so I'll take a walk in the morning; maybe I'll try the metro for the return trip, which (unlike the Milan one) is very modern and completely automatic. Here are my original articles published during this week. Practical PHP Refactoring: Remove Assignments to Parameters is a small scale refactoring to ensure the values of parameters remain invariants of a method. Practical PHP Refactoring: Replace Method with Method Object describes how to extract a too complex method as an object of its own. The era of Object-Document Mapping is a snapshot of the current Doctrine tools for mapping PHP objects to a NoSQL database. 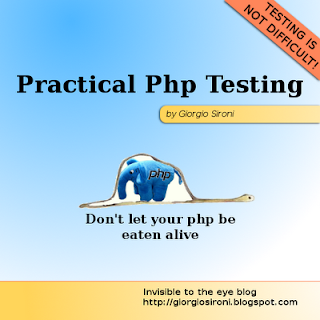 I will be in Torino on Monday for PHP.TO.START, a day-long event oriented to PHP businesses and university students. The event would be in Italian and has been created by Indigeni Digitali and Skuola.net. Subscription is mandatory and closes on Sunday. I will make the trip with the 8:00 AM Freccia Rossa if you're coming from Milan. It's always with you, because it fits in your pocket. You don't have strange synchronization processes which would eventually overwrite something. It does not require an Internet connection, so it works everywhere free of charge. It does not force you into a textual form or anything, you're free to draw mind maps or graphs. And it is web 2.0, if you buy it on eBay (not suggested due to shipping costs). No seriously, leave out the web 2.0 part. The fact is that the information I keep in this notepad has a cycle that goes from written to discarded of some days at maximum: I write on it Google queries I should make, ideas and exercises got from books that I should explore, or titles of articles to write. Since I do not have to keep these information around for long, there are no disadvantages with respect to a digital form. I'll never write an article on it, but for my reminders works pretty well.